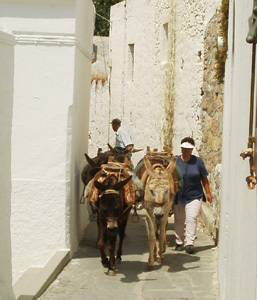 The most common form of transport in Lindos is The Donkey! Working from the Donkey Station near the Main Square the Donkeys take tourists to and from the Acropolis. They also meet the Rhodes boat excursions to carry tourists up the hill from the Pallas Beach. You will regularly have to stand aside in the narrow streets while the donkeys pass - and... watch where you tread! The only other transport allowed in the streets are bicycles, motor-bikes, the 3-wheel motorised carts (used to deliver luggage to villas and the narrowest of vans (used for deliveries and building works). TAXIS - work from the taxi rank in the Main Square. There is a set tariff for journeys on display in the square - so check your price before going and, if necessary, stand your ground if the driver wants to charge you more than you think is right. If you need to go to the airport by Taxi on a regular departure day - make sure you book your taxi a day or so in advance. Again - verify the price when you do this - there may be a higher charge for booking in advance! Taxis are almost always Mercedes and almost always go too fast. BUSES - There is a regular bus service between Rhodes Town and the south of the island. 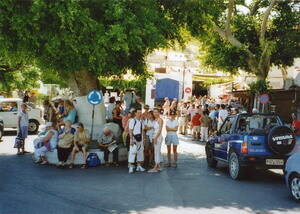 It takes about 1 hour twenty minutes to get to Rhodes from Lindos (calling at many villages and towns on the way). There is a timetable in the Main square. 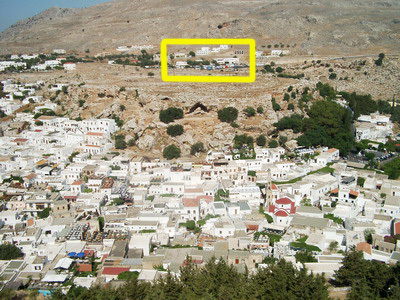 You have to go to the bus stops at the main car-park, above the village, to catch a bus to Pefkos or Rhodes. During the main part of the day there is a shuttle bus service between the Main Square and the Main car-park which< I think, now costs 50 cents. The bus is likely to be hot so take a drink with you. HIRE CAR - If you arrive at Lindos by car, you will have to park at one of the free main car-parks or in the Pay and Display spaces. Tourists should use the Main car-park at Krana, above the village. If you are visiting St Paul's Bay, you can use the car park above the Bay - it is mainly used by residents and Hire Car Rental companies. The upper section of road between the top car park at Krana and the main square and along the road to the main beach both have Pay and Display spaces (I think the cost is several euros for the day). The buses carrying tourists to and from the airport load and off load at "Lindos Reception" at this car-park. Avoid driving into the Main Square at all costs. There is very little room to move around and you will only make a problem far worse and, more than likely, get shouted at! The only reason for driving into the Main Square is to access the road to the main beach (where there is, rarely, an odd parking space). To do this you have to drive into the Square, drive around the tree, keeping to the right, go to exit the Square and then turn right into the road to the beach. Use the same procedure when leaving from the road to the beach.